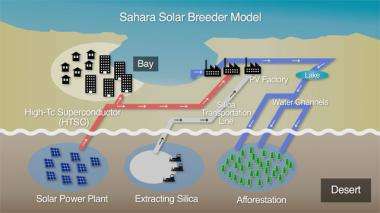 (PhysOrg.com) -- A joint project by universities in Algeria and Japan is planning to turn the Sahara desert, the largest desert in the world, into a breeding ground for solar power plants that could supply half the worlds electrical energy requirements by 2050. Leader of the Japanese team, Hideomi Koinuma from the University of Tokyo, said while no one has tried to use desert sand as a source of high-quality silicon before, it is the obvious choice and will be of high enough quality. The Sahara Solar Breeder Project (dubbed the Super Apollo Project by Koinuma) is being developed as part of the International Research Project on Global Issues by the Japan Science and Technology Agency (JST) and Japan International Cooperation Agency (JICA). The team expects to have to overcome many problems, including frequent sandstorms, the need to use liquid nitrogen to cool cables and to bury them in the sand to minimize fluctuations in temperature, and so on. The initial aims of the research will be focused on tackling the expected challenges and demonstrating the projects viability. Training engineers and scientists from Africa in the entire research and development process is also a goal of the project. Another project aiming to harness solar power in the Sahara was launched last year. The Desertec Foundation aims to supply 15 percent of Europes electricity requirements by 2050 using high-voltage direct current transmission lines without superconductors. Using local resources and energy to bootsptrap the project into existance. I like that. The supply of powering half the world is very positive. Standards have to be met before anything is built. The team expects to have to overcome many problems, including frequent sandstorms, the need to use liquid nitrogen to cool cables and to bury them in the sand to minimize fluctuations in temperature, and so on. What is the current energy return on energy invested (http://en.wikiped...i/EROEI) for solar? I don't know if solar power is even at a break even point yet. If the factories that make solar cells and the vehicles that transport them to where they are used and the people who maintain them all had to use electricity generated by solar power instead of cheep coal could they actually break even? If they can break even, by how much? It doesn't do society much good if 50% of the people have to be employed in the production and maintenance of solar power. We have a comparatively small percent of people engaged in energy production now and sociologist predict anything less than a 3 times return on energy invested to energy returned makes modern society very difficult to sustain and reduces most of mankind to a barely survivable energy subsistence society. That said: the 'solar breeder' concept is interesting and they should definitely give it a go. As is often the case with these sorts of stories, this is a half baked idea. Good luck guys. Come back when your pilot plant is supplying everything needed for the next two...or even the next one. Spain spent billions and billions on this sort of stuff. Only a matter of time before we will be asked to bail them out of their financial mess. Combining PVs with agroforestry will increase the electrical output of the PVs because of the evapo-transpiration, which will maintain PVs nearer ideal operating temperature. Shelter belts will reduce dust. And then when all of Europe, Middle East and India are powered by this, some terrorist will blow up critical cables and cause WW3. As for another alternative energy source to us that works best at night, they might consider geothermal. There is already moduler power plants that can generate megawatts of power from water a bit warmer than hot coffee. And my understanding is, if one goes deep enough there is very hot geothermal power about any place on earth. Since the desert gets very cold at night (due to the fact that clear skies let the heat escape); geothermal would be the most efficient at night. And it may be relatively easy to use the flip side of the solar panel for a radiator at night, as well as being a cooler in the day time. nice, however 500km will not get you from sahara to europe. how to you cross the ocean? a cable on the ocean floor? how about emi effect on the creatures that live deep in the ocean we are talking here about 100 GW of power. Idea sounds good, however commercial aspects can really knock it down quick. To tic_tac: Just a guess. It sounds like they are proposing making the desert bloom. That by itself will take a quite a bit of power, just providing fresh water. That done though, I suspect they will have enough power sub-stations to get past the Mediterranean Sea; if there is extra power left. Making liquid hydrogen may work better. My calculation about solar, though, suggested that a very large area of area would be required to address present demands. And that is before non-emission vehicles get more common and added to the mix. So that is where I see deep geothermal as such a great thing. And it would drop the earth's core temperature only 1 degree in 100+ billion years at our present use, according to my calculations. And that does not include any heat added by potassium's radioactivity The Sun is suppose to fail in about 5 billion years. So it sounds like a safe bet to say there is enough deep geothermal energy on earth for it to last for as long man is here.